My daughter is 6 months old now and all I can think of is how tiny she was when she was born. 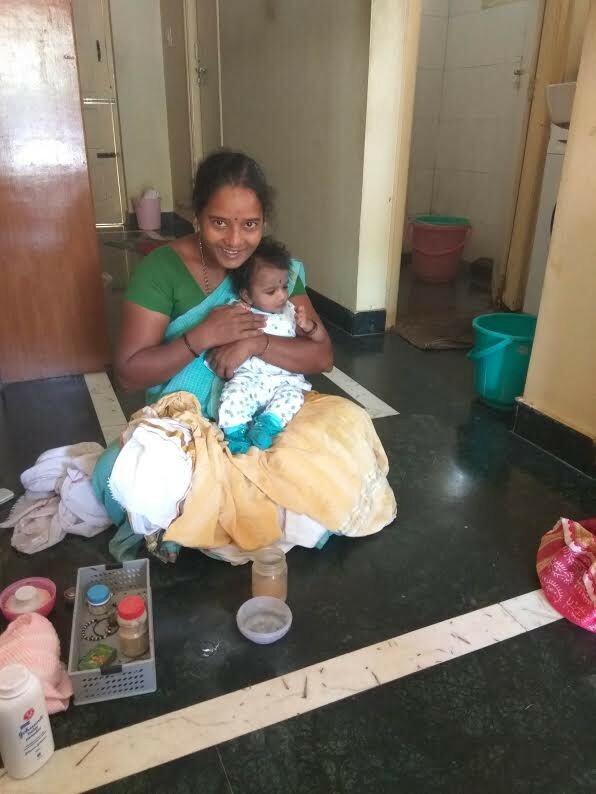 Thankfully Amma found Radha, who is kind of the official baby-bath-giving person in our Layout.She laughed it off when we said that the baby weighed around 2.5 kgs in the final scan and said that she has handled babies who were just 1.9kgs. She has been giving bath to Dhatri since she was just 5 days old and I seriously was amazed at her courage to handle this super small person. She would come everyday in the morning with a huge smile on her face and would arrange two huge buckets of hot water and when I handed over Dhatri to her, it would be one small celebration at home, with Appa setting up the sambrani, Amma checking the water temprature and always complaining that its too hot for the baby. We would then mix aarathi to take drishti after the bath, green gram flour and turmeric was used to wash off the oil. I would pick out the clothes. Dhatri really enjoys her bath time and there is this huge smile every time we take her to the bathroom. This has convinced Amma that she has the best grandchild on the planet, she tells me babies generally fuss when they realize its bath time,recalling her younger siblings and her own two kids. Giving bath to Dhatri usually involves two people. Person putting baby on legs — Kind of the master in the whole process. 2. Person putting water on baby — The one who has to listen to person 1 and puts water on baby after her oil massage. After I moved back with A, after the long pregnancy and post-partum, giving bath to Dhatri has somewhat helped us bond better and also with the baby. Here of course I give her bath(Person 1) and A is Person 2. He now wants to put her on his legs and give bath since its really enjoyable and I’m refusing it saying you need a minimum of 6 months to learn the entire thing. Radha with 3 months old Dhatri.